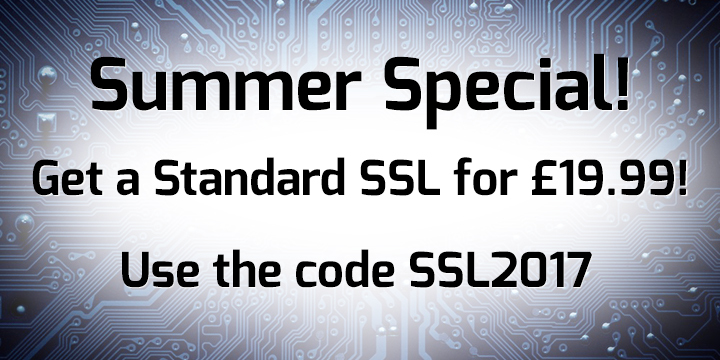 This summer we are offering a Standard SSL Certificate for only £19.99 (usual price £29.99). Our Standard SSL Certificate’s are usually issued in minutes, and can be used to add the secure padlock in a browser to a single domain. This offer will run until the end of September, and you can buy as many certificates as you need to protect your domains. To take advantage of this offer, visit our SSL Certificates page and select the Standard Certificate. Use the promotional code SSL2017 during check out and save £10.00! There are many reasons for securing your site with an SSL certificate, one of the most noticeable of these is it lets visitors to your site know that they are secure. Any site that has a verified SSL certificate will use the HTTPS protocol and display a padlock in the address bar, which lets your customers know that any information that is exchanged has been encrypted. Web users are increasingly security conscious and prefer to use sites that they can trust. It is also worth noting that Google and other search engines tend to favour sites that have secure 2048-bit encryption, and will give sites with an SSL certificate better page rankings. If you would like to know more, or you would like to chat about your security requirements in more detail, then please get in touch, our support team will be happy to help! How do I install and setup my SSL Certificate? We have a number of video guides to help you through the process of setting up and installing your SSL Certificate, which can be found on our YouTube channel. Don’t worry, it’s not a very long winded process, and if you run into any problems our support team can guide you through the process.